For top U.S. lenders, the next years are all about embracing opportunities. Boston, March 13, 2014 – Leading U.S. retail credit lenders seem ready to put the recent period of challenges behind them—the budgets are set, the plans have been formalized, and the news seems positive. But how exactly does the credit industry propose to grow revenue, improve efficiencies, and protect market share from risk and competitors, all with limited budgets? By leveraging what they already have, refusing to allow here-today, gone-tomorrow competitors to threaten their institutions, and returning to the solid credit policies, product offerings, and manageable IT spending of yore. This report highlights product- and technology-level opportunities and attendant challenges for growing enterprise revenue through retail credit products, and discusses which IT initiatives and product developments will figure prominently in creditors' technology plans, strategies, and budgets. 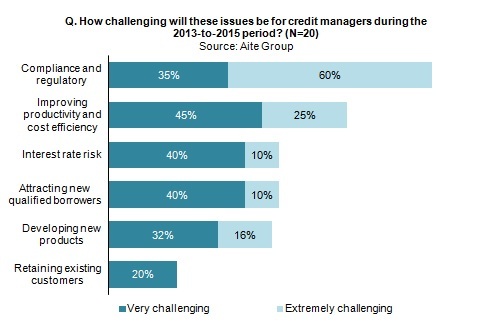 It is based on ongoing, in-depth Aite Group interviews with leading U.S. retail credit providers. This 24-page Impact Note contains 13 figures and two tables. Clients of Aite Group's Retail Banking and Wholesale Banking services can download this report. How Have Americans’ Financial Lives Rebounded From the Recession?